The American Council of Teachers of Russian designates ACTR Russian Scholar Laureates each school year. Every school where Russian is taught may designate one out­standing sophomore or junior for this award. Stu­dents in other years are not eligible, and there can be only one award per school. Any school that has more than 100 students studying Russian may nominate two students. the current Russian teacher’s name, a list of the Russian courses taken, and grades received. The student’s Russian teacher should complete an electronic application-nomination. The nomination must be complete and received not later than June 30 each year. Only electronic nominations are accepted. inclusion in a nationally published an­nouncement of the award in the ACTR Letter [the newsletter of the American Council of Teachers of Russian] and on the Website of the Ameri­can Councils for International Education: ACTR/ACCELS, and may appear in other media. The award announcement will in­clude the student’s photo, name, school, and Russian teacher’s name. The student’s address will not be made public but is need­ed for possible correspondence. 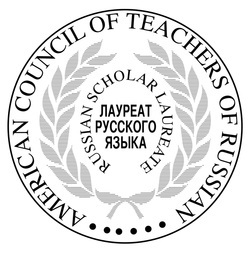 There is no fee for participation, but teachers must be current members of the American Council of Teachers of Russian by decision of the ACTR Board of Directors in May 2009. Encourage your school administrator to nominate a student. Feel free to contact the Chair if there are any questions. Nomina­tions for this award will be acknowledged promptly. Join this program and celebrate your best students!